Most Android apps use a caching feature to store temporary data on the device. A basic example is a web browser that saves visited web pages to the cache to open them faster then next time you load them. The overall cache used by applications on the Android device growth over time, and while you can clear the cache for apps individually from the application manager, it is not really the most practicable feature if you want to clear all cached data on the smartphone or tablet. The core benefit of clearing the app cache is to free up disk space on the device. You may also be able to fix several related issues, like low memory warnings that you may receive when your phone's storage is filled to the brim. App Cache Cleaner is a free Android app that improves cache cleaning significantly. Probably the biggest feature that it adds to the device is the ability to clear all app caches with a single tap once the application has been opened on the device. 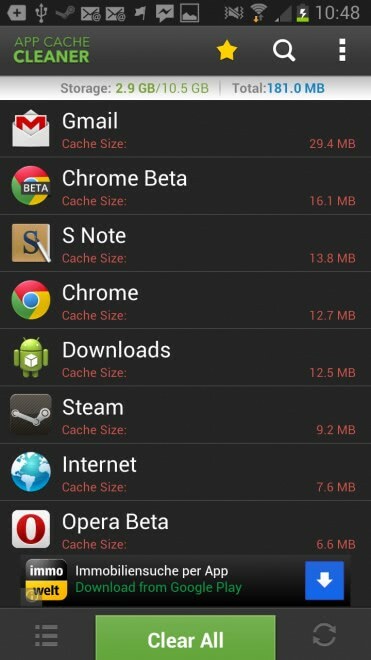 The application displays all apps installed on the system that use the cache, sorted by size starting with the application that uses the largest amount of storage on the device. You can tap on the clear all button right away - even before the list is fully populated - to erase the cached data of all apps on your phone or tablet. You can furthermore tap on the settings button to change the sorting, by name for instance, or use the search to find a specific app faster. A long tap on any application displays a context menu that you can use to clear the cache of that app, share the app with friends, view it on Android Market, open the application, or load the application's detail page on the phone. App Cache Cleaner ships with automation options that some may find useful. You can configure the app to automatically clear the cache of all apps when you open the program, or configure it to clear the cache in intervals that you specify.